Place the aluminum pan on top of the cooling rack. Using a pair of kitchen scissors, cut a flap into one side of the aluminum pan large enough for the overhanging cake round to come through. 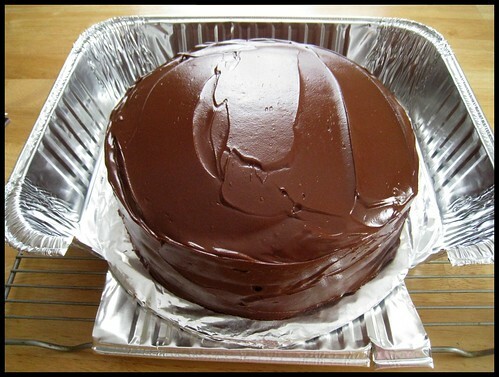 Place cake in the aluminum pan and cover with the lid. A portion of the lid may settle into the top of the frosting but this can be smoothed out later. If you can’t find a pan with a lid at the store, just get two large pans. Cut a flap into both of the pans and use one to cover the other, lining the flaps up on the same side of the cake. You may have to reshape the top pan a little so that it fits securely inside the bottom pan. Using the cooling rack as a base, grab your fabulous cake with both hands and go. First off, yummy cake! And second: look at you, MacGyvering a cake carrier! Aren’t you clever! TKW, my inner MacGyver really came through on this one. I wonder if there’s any kind of merit badge I can get for this? Too funny Wendi! Hope you guys had a great holiday! A girl’s gotta do what a girl’s gotta do to safely transport a cake. It may not be pretty but it works.